NECK PAIN | GEORGE D. GOUDELIS MD. Ph.D. 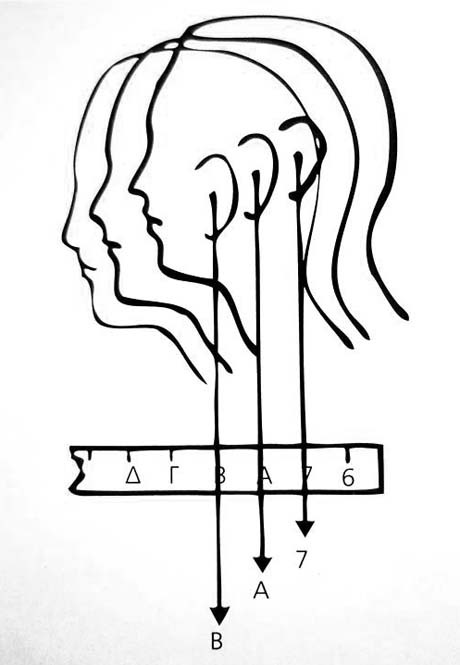 The neck is the part of the body which connects the shank to the head. The cervical spine consists of seven vertebrae and is the most mobile part of it. Strong muscular and ligamentous structures adhere to the vertebrae creating a strong anatomical structure such that it can meet the extremely high demands of the region during the life of man. The neck pain is not a disease but a clinical entity that actually describes the symptom that is the pain of neck and should be done the necessary investigation to ascertain the causes of pain. 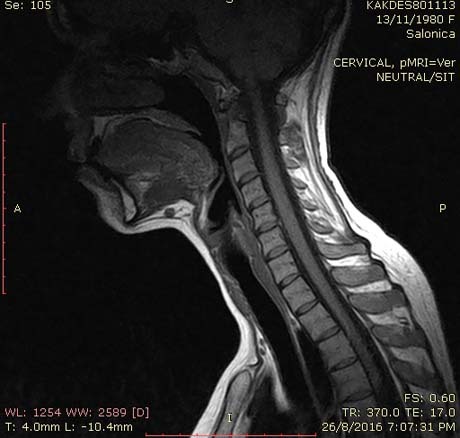 Also the term cervical syndrome describes a range of clinical conditions that concern the patient but without this term to indicate the reasons for the problem. For the effective therapeutic approach the Orthopaedist should primarily been clearly diagnosed the cause of a problem. Without the precise identification of the problem will not be effective and the patient's treatment. 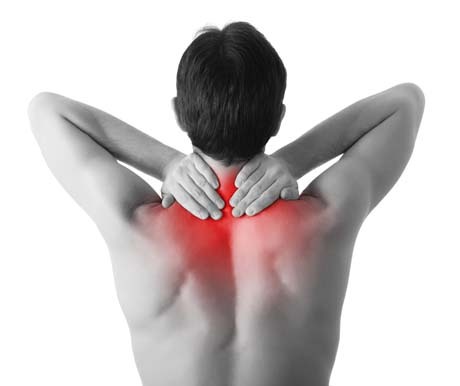 Muscle causes are the most common cause of pain in the neck in his youth. The long preoccupation with the computer and often in the wrong posture of the head and neck are the main cause of growth of muscle spasms in the neck muscles (trapezius muscles, short paraspinal muscles, etc.) and indirectly cause straightening of the cervical spine, loss ie the normal position of the neck lordosis. The result thereof is the pain challenge most often chronic nature. In muscle causes included the muscle torticollis, clinical entity in which predilection spasm of muscle groups (sternocleidomastoid muscle), from only one side of the neck without the patient may turn the head because of the intense pain. This condition is benign and transient, and with proper treatment subsides in the next 7-10 days. Right: the correct posture. We observe the normal torques of the forces applied to the vertebrae is exactly opposite in relation to the wrong attitude. 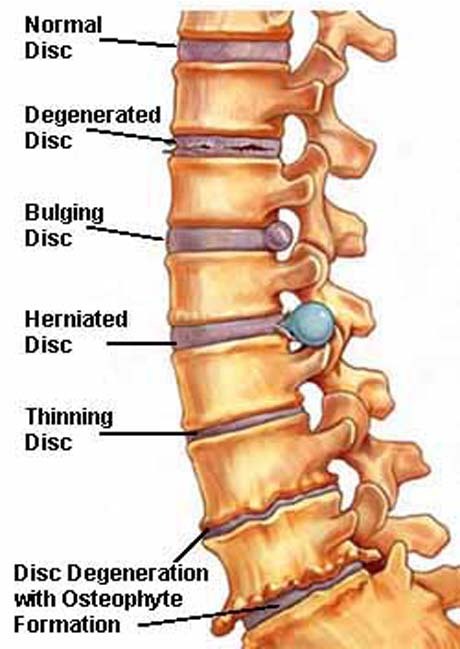 The causes related to the intervertebral discs occur in all age groups with a growing trend at older ages. As in the lumbar and cervical so between the vertebrae are intervertebral discs which act as shock absorption system of the spine and of increased overall mobility protect the noble structures such as the spinal cord and nerve strains that emerge from this . prolonged small loads exerted wrong way up on him (most common cause). or very large load as abrupt application of large forces eg in a car accident, sports injury or attempt cargo support to the head or neck. 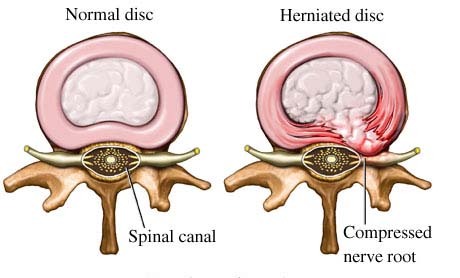 After age 40 the intervertebral disc gradually loses height resulting in the interval between the adjacent vertebrae but decreases creating thereby stress the joints between the vertebrae and growth conditions osteophytes and spondylitis which is another cause of neck pain. The symptoms that the patient is may be mild and well tolerated and as audible and intolerably. 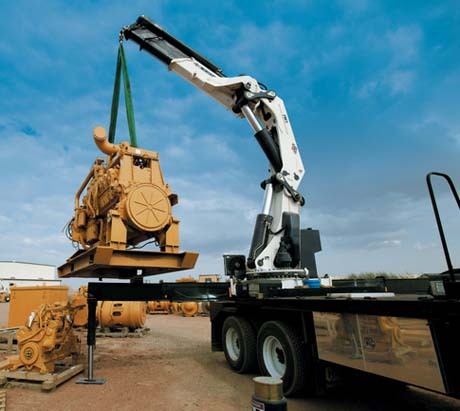 It can last from a few days to several weeks and months. Local may occur in the neck or to reflect on the shoulder, the shoulder or upper limb. The patient may report pain during limited anatomical movements, rest pain or even pain during night which does not allow him to sleep.Also the appearance of numbness or tingling sensation on the shoulder or hand complements the clinical symptomatology of the patient. The headache is finally another clinical entity that may be due to problems in the neck. investigating retroreflecting pain in the upper end or head (tension headache). The radiological examination (X-ray), of the neck will give information on Orthopaedic surgeon regarding the state of bone structures - vertebrae and their relations with their -stenosis intervertebral discs. Also evaluated and the physiological lordosis of the cervical spine or the existence of straightening it. X-ray of the neck: Straightening of the cervical spine. CT (with 3D reconstruction) and MRI are modern diagnostic methods which give highly detailed anatomical information to the physician to investigate the cause of the problem. Computed tomography with three-dimensional reconstruction provides excellent information on the structure of the spine in place. Electromyography of the upper limb is the sometimes an indispensable diagnostic tool for assessing the condition of the nerves and the investigation of the cause of pain. The examination is conducted by qualified neurologist. Once primarily determined accurately diagnose the condition of the patient, the therapist Orthopaedic surgeon will design the treatment plan to address the problem. Medication is the first measure to deal with the pain and the solution of any existing muscle spasm. The nonsteroidal anti-inflammatory drugs and muscle relaxants were for many years the sole drug selection. In recent years developed new pharmaceutical groups that address the problem of pain from nerve pressure executives as we have the herniated intervertebral disc in a different way than the anti-inflammatory without affecting blood pressure, gastrointestinal and kidney . The patient can take them for a long time and the dosage should be individualized according to the patient's needs. In some cases the use of cortisone deemed necessary and may be combined with the drugs of the new generation. The cervical splints divided in the soft (made of soft materials such as foam) and hard. 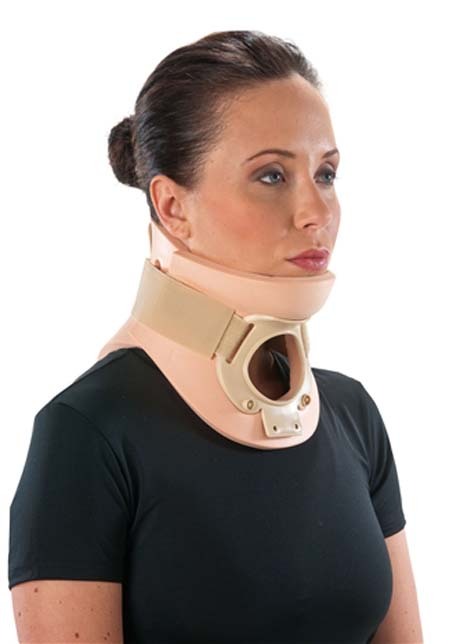 The current global trend is the replacement of soft splints from hard type Minerva, Philadelphia, or Miami, because they provide better stabilization of the neck having better functional result. 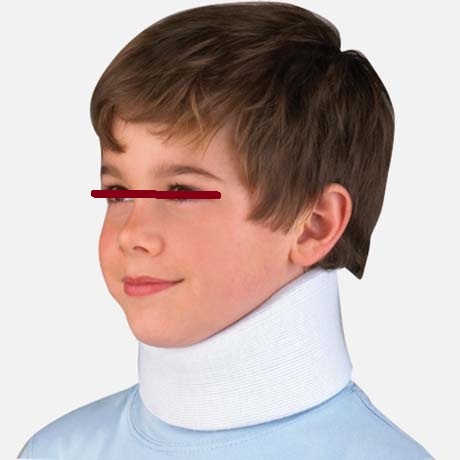 Of course, their use by patients is not very pleasant for this reason even today choose soft neck brace. The bracing shall not exceed 10 to 15 days and these days should apply 24 hours a day (and sleep if course is tolerable). If removed during night hours is recommended to use a special anatomical cushion of memory material. Physical therapy is an integral part of the treatment of the patient approach with neck problems. After the acute phase of intense pain, physiotherapist applying physical methods, e.g. ultrasount, electrotherapy - TENS-, kinesiotherapy and massage as well as specific therapeutic techniques helps the patient to complete the recovery.If the patient's symptoms persist for a long time or deteriorating character despite the above measures then surgery is the solution. Preventing a problem is much easier than dealing with the problem in most cases. The participation of the individual in prevention is crucial series of measures in everyday life. Regular physical exercise -pilates, yoga- guided from qualified trainer is the cornerstone for the health of our spine and not just that. A program of twice a week is a good suggestion. 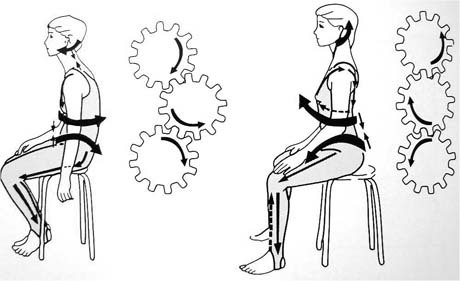 Avoiding aerobic type exercises involving intense vibrations will protect the person with problems in the spine.The passive exercise with vibration platforms are an absolute contraindication to people with hernias intervertebral disc anywhere in the spine (cervical or lumbar spine). 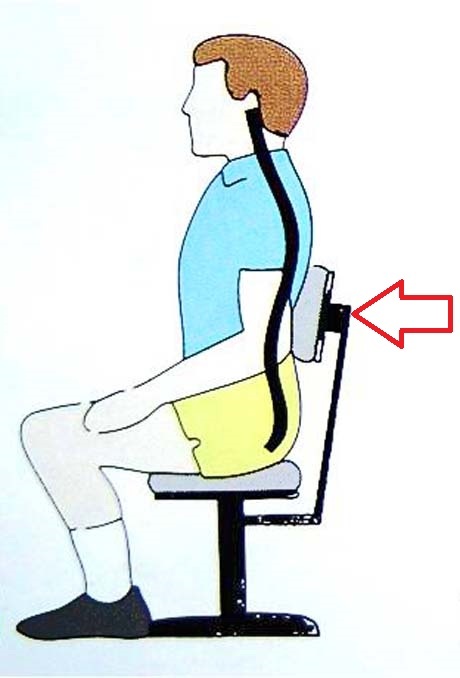 A safe program of aerobic exercise is the stationary bike with back support, the elliptical machine and a treadmill in the form of gait (slow and fast)The resistance exercise (machines or light weights) are not a contraindication enough to be under proper guidance and without exaggeration trends. 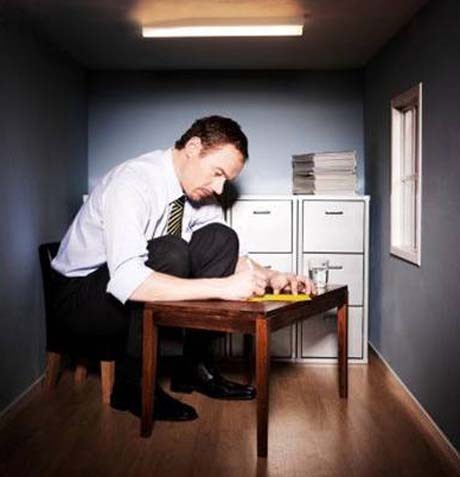 Individuals that their profession requires many hours in a chair (computer operator, secretaries, graphic designers, etc.) 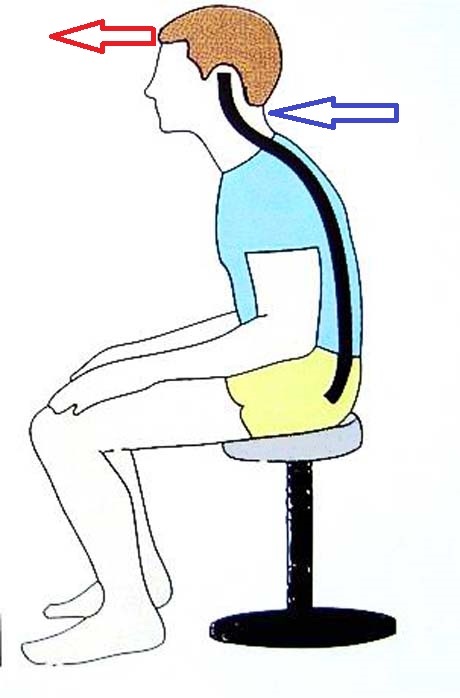 must periodically stand up and make anatomical movements in the neck and shoulders. 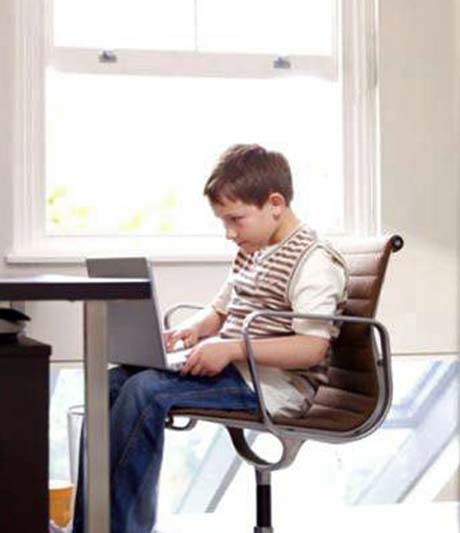 Proper Lumbar support (medium) with a special cushion, during sitting position ensures the correct position of the neck. The use of anatomic pillow to sleep made of material memory foam, protects the cervical spine from poor posture that may be taken by the neck during sleep. Physiotherapy has and preventive role especially in patients with a known problem in the neck and is recommended to be made twice a year in order to significantly reduce the chances of developing severe symptoms.